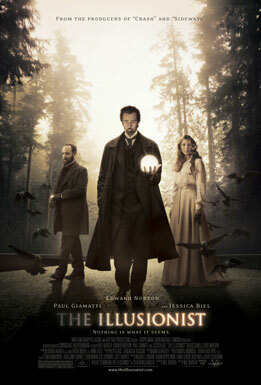 A supernatural mystery that combines romance, politics and magic, The Illusionist is the latest film from the producers of the Oscar winners Crash and Sideways. The film stars Academy Award nominees Edward Norton and Paul Giamatti as two men pitted against each other in a battle of wits. Eisenheim (Edward Norton) is a stage magician who amazes the audiences of turn-of-the-century Vienna, drawing the attention of Crown Prince Leopold (Rufus Sewell). When the Prince’s intended, Sophie von Teschen (Jessica Biel), assists the magician onstage, Eisenheim and Sophie recognize each other from their childhoods — and a dormant love affair is rekindled. As the clandestine romance continues, Chief Inspector Uhl (Paul Giamatti) is charged by Leopold to expose Eisenheim, and Eisenheim prepares to execute his greatest illusion yet. This entry was posted on Sunday, January 28th, 2007 at 11:15 pm	and is filed under Movie Trailer. You can leave a response, or trackback from your own site.